BetaDwarf - Official Blog: Community Happenings – After fire and fury comes... creativity! Community Happenings – After fire and fury comes... creativity! We had many exciting weeks, from the end of September all the way to November. This weekend however, is the first weekend without a tournament since October 21st! And we’re not even done with polishing and scaling up the competitive environment or implementing essentials like Spectator mode. So, all the competitiveness comes from our community – from you! That’s something, we’re really thankful for and you guys can be proud of. As soon as we know the Top3 of each category, we pitch them against each other in another poll. After 5 days, we will have our winner, the most wanted card and the Developers have some work to do. Please note, that BetaDwarf has the final say on all cards and their implementation. In order to make our task easier, you should try to provide as much information as possible. We’re especially interested in the concept (how it’s going to look, rarity, mana cost, maybe some backstory), mechanics (special effects, abilities) and stats (Health, Targets, Movement Speed, Attack Speed, Damage, Range etc.) - and obvious counters. Another important information: everyone is allowed to participate. But no matter how many ideas you have, we cannot accept more than 3 submissions per category! However, we cannot provide you with more information, yet. 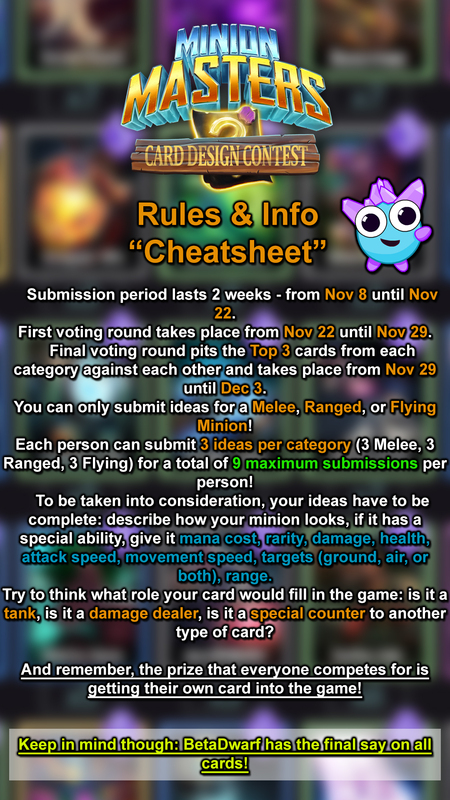 FFA, Dipshit and the King Puff Cup crew are still preparing the tournament and the rules, so watch out for further announcement in the next few days on Discord, Reddit and Steam. This week, we keep it nice and short. However, it's not the length of a text, but the content within that matters! At the end of this blog post, once again we want to thank our whole community for supporting us, all the dedicated Streamers & YouTubers for their effort, card designers for the submissions & each and everyone for playing Minion Masters!